People with mild to moderate dementia (and Alzheimer’s) are usually cared for by the family personal care physician and the patient’s family. The personal care physician is often very busy and is not a specialist in the area. The family is often ill equipped to take on this task due to lack of formal training, education, and experience. Family caregivers and the primary caregiver usually take a learn as you go approach. A team of physicians, teachers, and researchers have created a set of guidelines for personal care physicians on how to manage dementia once a diagnosis is made. This article should be read by physicians but I found it very helpful as a caregiver. From the caregiver perspective it will help you understand the services you need and help you interact with your family physician to assure that appropriate actions are being taken and treatments rendered. People with mild to moderate dementia are cared for largely by family physicians as well as the patient’s own family, and management of care can be complex and challenging. A team of clinicians, teachers and researchers from the University of Calgary, Dalhousie University, McGill University, Sunnybrook Health Sciences and the University of Toronto, University of Ottawa, University of Western Ontario, Universite de Montreal, University of Saskatchewan and affiliated institutions have created comprehensive guidelines for family physicians on how to manage dementia once a diagnosis has been made. This approach focuses on supporting both the patient and the primary caregiver. to either draft these documents or whether they should be put into effect. Original content the Alzheimer’s Reading Room. It is getting more and more difficult for me to get my mother to exercise. Recently one of her best friends, now 79, received a scare when her good friend told her she was starting to get forgetful. She asked me what I thought she should be doing to help protect herself against dementia and Alzheimer’s. My answer to this is question is always the same–Rule #1 Exercise. Our friend decided on the spot to take my advice and join Gold’s gym. She did so immediately. We decided to attend the Silver Sneakers exercise class the next morning. I had trouble getting my mother to go to the gym class so I asked our friend to come over and help me convince her. It worked, thank goodness. On the way to the gym the best way I can describe my mother is zombie like. She could barely walk, kept telling me she was going to faint, and said she was sick. I could barely get her out of the car. When we walked out of the gym my mother was standing straight, had a smile on her face, and was communicating. It is rather hard for me to describe this unless you see it for yourself. This happens every time. 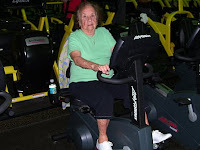 Exercise works for my mother who suffers from Alzheimer’s and the benefits are obvious. Our friend upon seeing this in person for the first time decided she will attend the class at least three times per week. 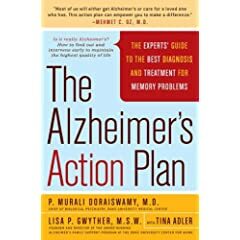 The experience reminded me of an article I read a while back that discussed the positive effect that exercise had on nursing home residents suffering from Alzheimer’s disease. Nursing home residents with Alzheimer’s disease who participate in a moderate exercise program have a significantly slower deterioration than those who receive routine medical care, researchers have shown. Dr. Yves Rolland, of Hospital La Grave-Casselardit in Toulouse, France, and colleagues examined the effects of a program of exercise for one hour twice weekly on activities of daily living, physical performance, nutritional status, behavioral disturbance and depression among 134 Alzheimer’s disease patients in nursing homes. The patients were 83 years old on average. They were assigned to the exercise program, which focused on walking, strength, balance and flexibility training, or to routine medical care for 12 months. As reported in the Journal of the American Geriatrics Society, 110 participants completed the study. Among the 56 subjects in the exercise group who completed the study, the rate of adherence to the program was about 33 percent on average. At the end of the 12 months, the average activities-of-daily-living score was significantly more improved in the exercise group than in the routine medical care group, Rolland’s team reports. In addition, average walking speed improved significantly more in the exercise group than in the routine medical care group at 6 months and 12 months. However, the exercise program had no apparent effect on behavioral disturbance, depression or nutritional assessment scores. SOURCE: Journal of the American Geriatrics Society, February 2007. This clinical trial is worth considering. Patients who initially receive placebo (inactive sugar pill) will at a certain point in the study be switched over to active drug, LY450139. This means every participant gets the drug. Additionally, all patients who complete this study will have the option to continue receiving LY450139 by participating in an open label study.This means you can continue receiving the drug free of charge after participation in the clinical trial. LY450139 is being tested to see if it can slow the progression associated with Alzheimer’s disease by inhibiting gamma-secretase, an enzyme that can create a sticky protein called amyloid beta. Slowing the rate of disease progression could preserve independent functioning and quality of life for Alzheimer’s patients in the milder stages of the disease, potentially delaying the onset of the severe stages of the disease. All of these test will be conducted throughout the study. * A chemical marker of AD in the blood which may be lowered by LY450139. * To measure levels of LY450139 and their effect on safety, chemical markers and effectiveness. This is a very thorough clinical trial. Here is some additional information from the Eli Lilly website. Eli Lilly and Company (NYSE: LLY) has announced today the start of a Phase III clinical trial studying LY450139, an investigational gamma secretase inhibitor for the treatment of mild to moderate Alzheimer’s disease. LY450139 is being tested to see if it can slow the progression associated with Alzheimer’s disease by inhibiting gamma-secretase, an enzyme that can create a sticky protein called amyloid beta. Current Alzheimer’s disease theory is that subtypes of amyloid beta clump together into plaques that eventually kill off brain cells. By blocking gamma secretase, there is less amyloid beta formed, potentially slowing brain-cell death. Slowing the rate of disease progression could preserve independent functioning and quality of life for Alzheimer’s patients in the milder stages of the disease, potentially delaying the onset of the severe stages of the disease. Currently available treatments for Alzheimer’s disease have no documented effect on amyloid beta. They provide modest improvements in symptoms but do not slow the underlying disease process. IDENTITY is a randomized, double-blind, placebo-controlled trial that will be conducted in the U.S. and 21 additional countries. As part of IDENTITY, 1,500 patients will be studied for 21 months, and an open-label extension will be available to all participants completing the study. Patients who are taking currently available symptomatic treatments for Alzheimer’s disease can continue treatment during their participation in IDENTITY. Because the IDENTITY study also incorporates a “randomized delayed start” design, even those subjects initially assigned to the placebo arm of the study will be started on active LY450139 treatment sometime before the end of the 21-month study period. Both the subjects and investigators will be blinded to the exact timing of this delayed start of study drug administration. “Alzheimer’s is a devastating disease that destroys brain cells, affecting everything from a patient’s memory to their work and social life. Currently available medications treat the symptoms of Alzheimer’s disease but have not been shown to change its underlying progression, creating an urgent unmet medical need. Today, we are proud to announce the start of the IDENTITY clinical trial and hold hope that LY450139 will represent an advance in the attempt to slow the progression of this fatal disease. We encourage patients or their caregivers to review the enrollment criteria for IDENTITY to see if they are eligible to participate,” said Eric Siemers M.D., Medical Director, Alzheimer’s disease research for Eli Lilly and Company. Alzheimer’s disease is a progressive neurodegenerative condition that is the most common cause of dementia in patients over 65 years of age. Estimates show that 6-8% of people over age 65 are affected by Alzheimer’s disease(1), totaling approximately 5 million people in the United States alone(2). Every 72 seconds, an American is developing Alzheimer’s disease(3), and it is the seventh-leading cause of death in the United States(4). The direct and indirect health care costs associated with Alzheimer’s disease in the U.S. are estimated to be about $150 billion(5). In 2005, the total cost worldwide was estimated at $315.4 billion(6). Given the aging population, without the availability of medicines that delay or prevent the onset of Alzheimer’s disease, the number of affected people is expected to at least triple by the year 2050 in developed nations(7). The average duration between onset of symptoms and death due to complications of Alzheimer’s disease is about 8-10 years(8). The burden to caregivers and health care costs can increase dramatically in the late stages of Alzheimer’s disease, when patients cannot maintain independent function and are frequently bedridden. To more completely characterize the disease-modifying effects of LY450139, a number of optional biomarker sub-studies will be available to patients. These optional sub-studies will utilize new brain-scanning techniques to determine the amount of amyloid beta plaque in the brain, employ other, more established scanning techniques to examine brain structure and function, and evaluate a number of additional biochemical measures of Alzheimer’s disease. By determining the effect of LY450139 on these objective biomarkers, a more complete understanding of the effect of LY450139 on underlying Alzheimer’s disease pathology is possible. Additional information regarding the IDENTITY trial, including global recruitment sites, may be found by visiting www.clinicaltrials.gov or www.lillytrials.com, or by calling 1-877-CTLilly (1-877-285-4559). LY450139 inhibits gamma secretase, an enzyme that cuts a protein, creating a shorter, sticky protein called amyloid beta. Alzheimer’s disease theory suggests that some subtypes of amyloid beta clump together into plaques that eventually kill off brain cells. Clinical studies have examined the effect of LY450139 on amyloid beta in blood and cerebrospinal fluid. The most frequently occurring side effects experienced in earlier clinical studies with LY450139 include diarrhea, upset stomach, and fatigue. For a more complete listing of potential side effects, prospective clinical trial participants should refer to the informed consent document. Paula Spencer posted this interesting article on Caring.com. This is likely to become a major health issue in the United States as baby boomers age. Feel free to add your opinion here or on Caring.com. The Alzheimer’s Disease Screening Discussion Group (ADSDG) recently conducted a survey. They found that most adults 55 and over lack knowledge about Alzheimer’s disease. * About 75 percent thought they could identify signs of Alzheimer’s disease in themselves or a loved one. * Yet, when presented with a list of symptoms, more than 90 percent were confused about which symptoms were associated with early signs of Alzheimer’s. * 34 percent have a loved one who they suspect might have Alzheimer’s. * Yet of those people, only about 40 percent encouraged their loved one to talk to a doctor about it. The online survey was conducted by Harris Interactive and commissioned by the Alzheimer’s Disease Screening Discussion Group (ADSDG), a consortium of multi-disciplinary experts in AD and senior health. The ADSDG issued a consensus statement in November 2007, recommending routine memory screenings for Americans 65 years of age and older and encouraging increased public education about AD. This year, the group commissioned this national survey as a next step to better understand public perceptions, attitudes, and knowledge about the disease, screening, and diagnosis. Both the survey and the ADSDG were sponsored by Eisai Inc. and Pfizer Inc. This AD survey was conducted online within the United States by Harris Interactive on behalf of Eisai/Pfizer between May 12 and June 4, 2008, among 1,040 U.S. adults age 55 and over. No estimates of theoretical sampling error can be calculated; a full methodology is available. This free guide is an excellent resource and should be especially interesting to baby boomers. 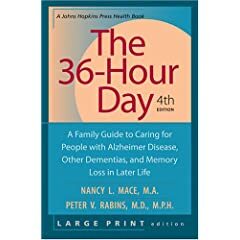 The guide includes: information about Alzheimer’s disease, information about a prescription treatment option, a doctor discussion guide, and caregiving tips. While you are on the website obtaining this free resource guide you can also select an option that allows a caregiving nurse to call you and discuss Alzheimer’s topics. The nurse can help you identify issues to discuss with your doctor, answer questions about Alzheimer’s, and provide you with important tips and resources in your area. To obtain this free material go to See The Signs. You can also visit these interesting areas while you are on the website. My mother is currently moving into the medium stage of Alzheimer’s so for us this is exciting news. I intend to send this information to our personal care physician and discuss it with him immediately. I just finished reading a study published in the journal Alzheimer Disease and Associated Disorders that indicates combining two different kinds of Alzheimer’s drugs works better one. This unique research took place over a long time frame, 1990-2005. Typical clinical trials last about 6-9 months. Those in earlier stages of Alzheimer’s disease are typically treated with cholinesterase inhibitors like Aricept, Razadyne, or Exelon. Those suffering from later stage Alzheimer’s disease are usually treated with Namenda (Memantine). The study found that people who took the combination of a cholinesterase inhibitor and Memantine showed a significantly slower rate of cognitve decline than those who took only a cholinesterase inhibitor or no drug. While still in an early stage and needing follow-up this study indicates that the combination of drugs significantly slows the deterioration of cognitive function in Alzheimer’s patients. Drugs to treat Alzheimer’s disease have shown only modest success in easing symptoms of the incurable illness that robs people of their memory and makes them unable to lead normal lives. But a new study from Boston researchers offers a glimmer of hope that combining two kinds of drugs may help delay progression of the symptoms. Researchers at the Massachusetts General Hospital Memory Disorders Unit report in the journal Alzheimer Disease and Associated Disorders that combining two types of Alzheimer’s drugs works better than giving none or one of the drugs alone to slow cognitive and functional decline. Previous clinical trials have compared the drugs with placebos in short studies of safety and effectiveness, but the MGH group says theirs is the first to look longer-term at patients in a real-world clinical setting. Their study was funded by the National Institute on Aging and the Massachusetts Alzehimer’s Disease Research Center. Led by Dr. Alireza Atri, the researchers analyzed the records of 382 patients who were treated at the Boston clinic from 1990 to 2005. The earliest group of 144 patients did not receive any medication, the second group got a cholinesterase inhibitor approved by the Food and Drug Administration in the mid-1990s, and the third group took that drug plus memantine, a drug approved in 2003 that helps patients think more clearly. The patients were followed for an average of two and a half years and given tests to measure both their cognitive abilities and their capacity to carry out the activities of daily living. People who took the combination of drugs showed a significantly smaller rate of decline than those who were taking only a cholinesterase inhibitor or no drug. Memantine was not studied alone because by the time it was available, cholinesterase inhibitors were widely used. The researchers accounted for differences among the groups, such as how early in the disease they were diagnosed and whether they had other illnesses, but the differences in how they scored on tests of cognition and function still held true. The results raise the intriguing possibility that the drugs may be protecting the patients’ brains from further deterioration, the authors said.